Take a look at most new homes and major renovations around Australia at the moment, and you will see a trend towards modern contemporary architecture that provides flexibility, innovative technology, and above all AUTHENTICITY. We are witnessing the preferences of a better educated consumer. They are seeking solutions to the impacts of climate change as they tire of inactivity by government, and seek to play their part at home. Aesthetically there is a shift to a warmer material palette of natural products that are friendly and sustainable. Simplicity is the new norm, as consumers seek products that are sleek, clean and neutral, but without being bland or “beige”. Neutrals allow the strategic but playful use of color in decore pieces and collectables to the point of glamour. Open floor plans have been around for awhile, and they continue to define the internal layout of our homes, but are evolving to be more functional. They are required to be “high performing” multi tasking spaces and they share their functions across rooms. Consumers want to use the spaces more often, rather than fill it with furniture that caters for one or two occasions per year. Creating spaces where larger kitchens, living and dining spaces merge together provide the stimulus for a more contemporary style of architecture. The kitchen has become the focal point of the family home. It’s not that long ago that outdoor living meant the patio, or deck and BBQ area, possibly around the pool. Today the divisions between inside and outside are non existent. 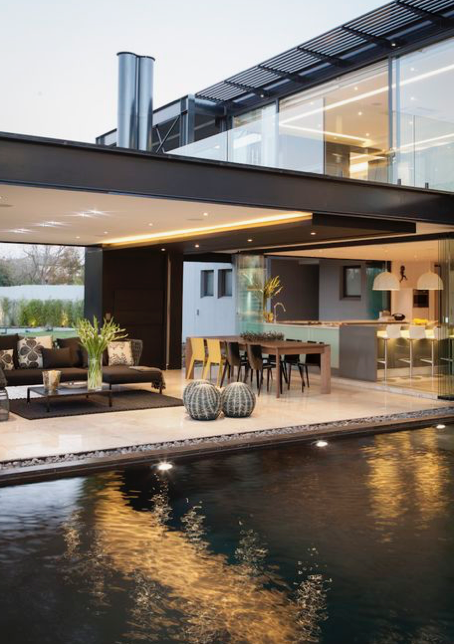 Outdoor living is often under the main roof, the wall has come down and the glass sliding door has been replaced with full width ‘floor to ceiling’ bifolds. The living space has effectively doubled in size. The backyard is now designed as an integral part of the home, it is part of the overall statement and experience. As the kitchen looks out to the outdoor space and vice versa, any division between them has either disappeared or at least blurred. The garden design for the backyard is undertaken simultaneously with the house design, often with the 2 or more professionals working collaboratively to provide harmonious and complementary outcomes. The architect and landscape designer now work together from project commencement, whereas garden design used to be undertaken some time later if the budget still permitted. The mutual respect that exists between these professionals is a reflection of this integration of all living spaces. The living space protrudes out into the garden, under the main roof. Pic courtesy of Pinterest. None the less we still refer to the inside and outside spaces in our conversation, but it just a matter of time before it is all referred to as the one living space. Authenticity is the other noteworthy trend, applicable to the entire living space. A home was once a testimony to status, the more ostentatious the higher the perception of affluence toward the home owner. People now want their homes to reflect who they are as individuals, and whilst it might measure their successes, they also see it as an expression their social conscience towards sustainability with smart and efficient design, inside and out. Brian has collaborated with Architects on previous projects where the client is seeking a seamless approach to the design of the overall living space. For a further discussion contact Brian, he will be happy to help.